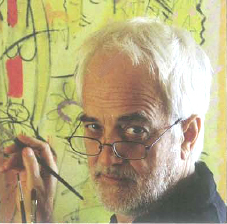 Several unifying qualities mark the successful artist: his artwork exhibits a unique and powerful vision to the viewer; his artwork resonates with multiple senses; his artwork explores new realms and dimensions of perception; and often most important, the artist is fearless in how he brings the work to the public. This last quality is often overlooked or under valued, but can become the determining factor of an artist breaking out, and the visibility and recognition of his work rising above that of others. Howard Lamar is such an artist. His art is rarely found in traditional markets because he has controlled the access to his work by featuring it primarily in one of his former California galleries in Carmel or Ojai. Still, his inventive style has sold worldwide to discriminating collectors who, over the years, ventured into one of his studios or private shows, and discovered an artist whose work called them back again and again. Many patrons own substantial collections of his work produced over the last forty years; these paintings show a broad spectrum of the artist’s development and maturation. Lamar’s art is considered one of the best-kept secrets in West Coast art circles; his line, form, color, and content serenade the eye, evoking primal images and timeless messages. If one studies Howard’s paintings, one may recognize the many signs - or icons - that are his keystones. Howard has a complex artistic voice, reverberating through painting, sculpture, and glass — stories drawn from his life, and those close to him. “My driving passion,” says Lamar, “is to express the Power of Beauty and these are my tools: strong line that insinuates volume, form that brings forth life, color that paints my love of family, friends, and life, and lastly, energy which to me is the essence of life.” Carving and sculpting play strong supplemental roles to Howard’s painting, bringing three-dimensional representations of his classic icons and themes to life. Howard has been interviewed multiple times by Leaders Magazine. In this century, Howard’s works explode with particularly vibrant zeal. His repertoire comprises both large and small scale works, incorporates brilliant colors, includes powerful new icons, and expresses his new artistic insights. Private showings and sales over the last few years have achieved artistic and financial benchmarks, with thousands of original pieces having been sold to date.